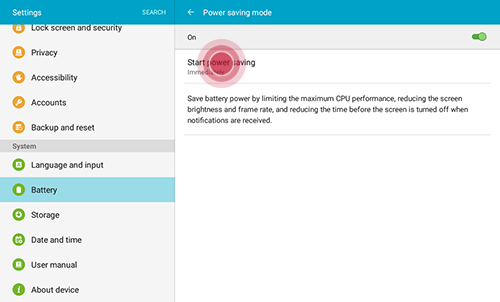 Galaxy Tab E: How do I Use Power Saving Mode on my Samsung Galaxy Tab E? 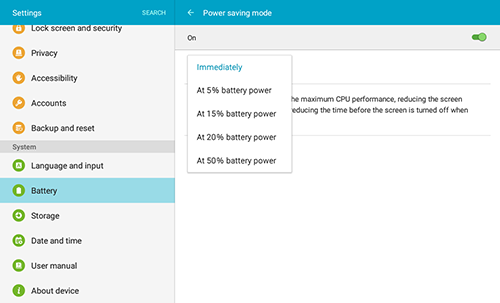 Power saving mode limits your device's performance to conserve battery power. You can choose which features you want to restrict. You can turn on Power saving mode manually, or set your device to go into Power saving mode automatically. Note: Battery power consumption depends on factors such as network configuration, signal strength, operating temperature, features selected, vibrate mode, backlight settings, browser use, and applications' usage patterns. 2. Scroll to and tap Battery > Power saving mode. 3. Touch the OFF slider to turn Power saving mode ON . 4. Touch Start power saving. 5. Choose when you want Power saving mode to take effect. • Immediately: Goes straight into Power saving mode. • At 5% battery power: Starts Power saving mode when battery power is at 5% or below. • At 15% battery power: Starts Power saving mode when battery power is at 15% or below. • At 20% battery power: Starts Power saving mode when battery power is at 20% or below. • At 50% battery power: Starts Power saving mode when battery power is at 50% or below. • Turn off Smart stay. 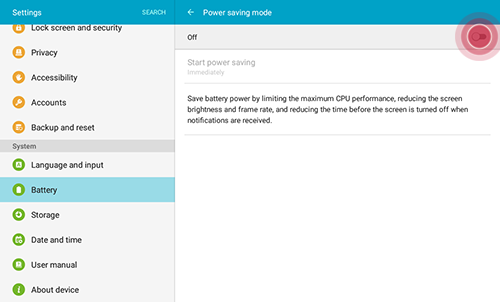 Galaxy Tab E: How do I Configure the Power Saving Modes on my Samsung Galaxy Tab E? 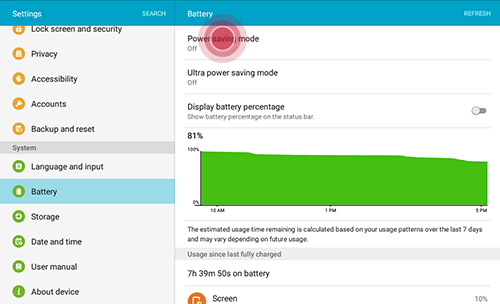 Galaxy Tab E: How do I Use Ultra Power Saving Mode on my Samsung Galaxy Tab E?